castlet67 had the most liked content! I have 2 48 inch 4 bulb fixtures available. I have upgraded to a LED T5 hybrid system. Make an offer. No room for them. I agree. I have removed the rock a couple days ago. Have you used dino x algae x? Everything is bare bottom. A few turbo snails as clean up is all. This is why I disappeared!! Lol. Yes,both exactly the same. Lol it is really messin with me Muttley. How can the algae grow with no nutrients ? I have a pair of clowns, feed every other day, hand feed 4 nems twice a week. Total volume is about 100 gallons. I am removing algae daily in Hope's that if the algae just cycles off on it's own nutrients. Maybe would explain why I have no readings on nitrate and phosphates. I do have one window that's shaded are drawn. I have blacked out the window thinking maybe natural sunlight could be playing a role. It's crazy bad in the one tank. I have blacked out the window in the room. Ok reef people. I've been missing in action for a while. Partly because I fished all summer and partly,mostly because of an algae nightmare.here it goes. I want some science involved with this. I have 2 4foot by 2 foot tanks. 10 inches deep. Both share the same sump,filtration, etc. I frag corals and place them in both tanks. Everything is the same. Lighting is on 10 hours. T5s come on for 1.5 hours then less. I ramp down the same way. 1 tank is pristine, the other,covered in heavy hair algae.i run 2 sumps. A 50 gallon with live rock, and a 30 gallon with refugium and chaeto.the rock sump had major algae growing in it. I have since removed that sump from the system. I run a large octopus skimmer wet and a roller mat system . Any ideas. I've torn the problem tank down,steralized everything and placed it back in line just to have the algae go crazy again in this tank only. So here are my parameters. Salinity 33.5 Magnesium 1560 Calcium 593 adjusted the dosing down a hair Dkh 10.3 adjusted a hair also Nitrite 0 ph ultra low hanna tester Phosphates 4 ppb ultra low hanna tester Temp 78 Par 78 ramping up to 180 then back down Manual removal every day of what I can get off the coral. 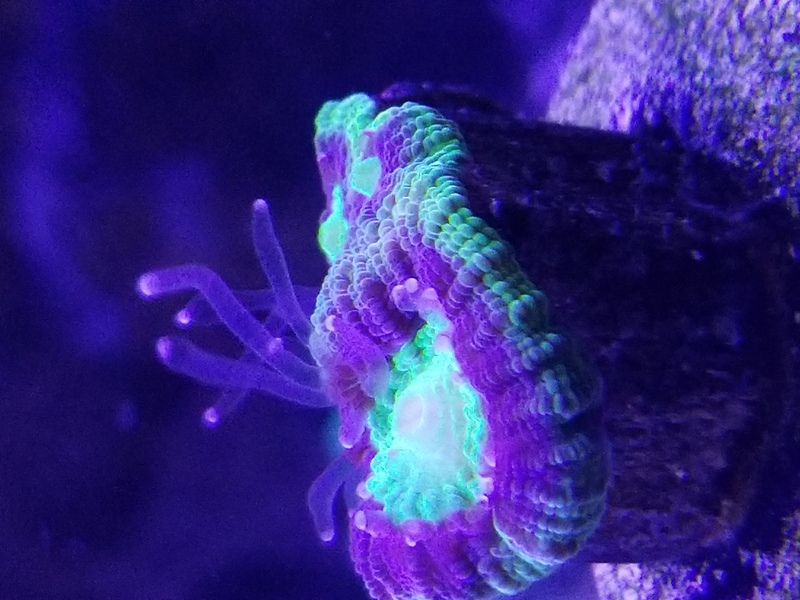 All the sps are growing well and great .color. Softies dont like the algae .looking sad Any ideas fellow reefers? Oh,did the blackout thing. Made things better for a couple days then right back to the nasty stuff again. Wont be able to go this year unfortunately. Hey Jesse. Im still here. Tanks are running. Here are some pics of the damaged leather. The color is starting to return and the bite marks not looking as deep once the crab was removed. It appeared splotchy until i removed it. The white areas were deep cuts,the i saw the crab tucked tight up against the main stem.